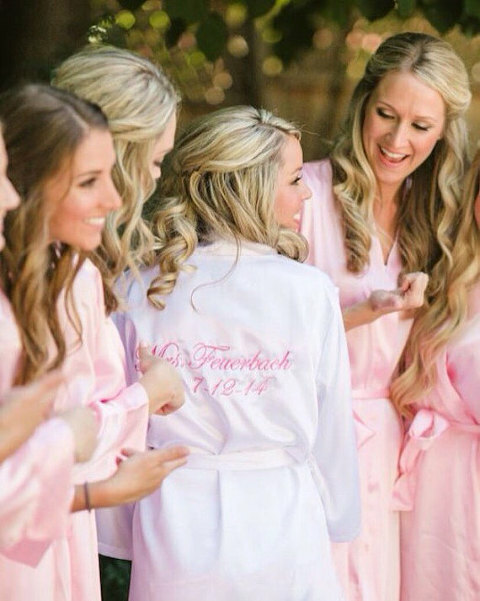 The quintessential “getting ready” photographs found everywhere from Pinterest to wedding blogs have given brides yet another decision to make: What will my bridesmaids and I wear the morning of my wedding!? You’ll want to look stylish – yet casual, as you’ll probably have your wedding photographer in the room. Bonus points if your bridesmaids will actually want to wear again (or at least won’t break the bank after that bachelorette party you had). We’ve got you covered with a round up of the latest trends we’ve seen in getting ready couture. From robes to rompers and a few in between, rest assured you and your BFFs will look cute, comfortable and effortlessly coordinated. 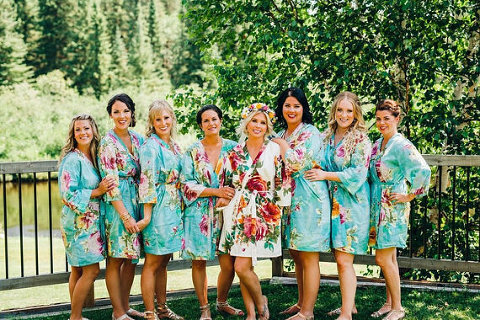 The majority of the bridal party getting ready photos you’ll see on Pinterest are in floral robes done by none other than Plum Pretty Sugar. With exquisitely soft materials, endless pattern options and gorgeous collaborations with brands like Anthropologie and BHLDN, it’s hard not to love their loungewear. However, we also included a top-rated Etsy seller who’s been in the bridesmaid robe game for a few years now and has yet to disappoint. You may also want to consider an embroidered, light-as-air silky robe in a universally flattering pastel shade, such as blush. We’ve also seen lace make a stunning appearance in several wedding photos. If nothing else, PJ sets have a safe reputation of being worn again after your wedding day. How cute is the adorable seersucker scalloped shorts and tank set!? Again, Plum Pretty Sugar makes an appearance due to their excellent selection of button up shirts with pants or short sets. Many brides also posted rave reviews about floral PJs from Etsy, and we picked our favorite button-up/shortie set below. Brides have been wearing larger, menswear shirts to get their hair done on their wedding day for generations now (so that you don’t mess up your hair or makeup when changing). A trendy twist to the traditional oxford is a denim/chambray style monogrammed button-up, which looks super chic for a rustic wedding. For the more modern bride, rock an off-the-shoulder top. Newest to bridal getting ready fashion, rompers and dresses round out our collection. Whether your style is boho-babe, spa-chic or nautically inspired, there’s something for everyone in this category. Our picks include a shoulder bearing romper that will photograph stunningly, a sleeveless cotton romper, perfect for a beach wedding and the traditional monogrammed maxi, all of which could double for a great pool coverup. As with any good outfit, you can’t forget the accessories. Personalized, open-toe slippers are a perfect gift, and since most weddings days start early, don’t forget the champagne flutes for Mimosas and Bellinis! *This post utilizes affiliate links which may generate a small commission from clicks that result in a purchase. Purchasing through these links helps support future website projects.